LASER GUM SURGERY ALTERNATIVE periodontal pocket and gum disease treatment by a U PENN-NYU trained GUM SPECIALIST. Laser gum treatment requires no cutting. 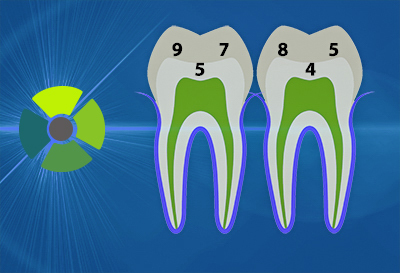 Instead, light energy interacts with diseased tissues to remove tartar and control gum disease. No stitching is required for laser gum therapy. The use of a laser results in minimal to no bleeding following your laser gum treatment. You will probably need only mild over-the-counter pain relievers (Motrin/ibuprofen or Tylenol/acetaminophen) after treatment, or nothing at all. Laser therapy results in a quick recovery for most of our patients - you will likely return to your normal activities the very same day. CALL DR. RESSLER AT 561-499-7400 to schedule a consultation today! PAYMENT PLANS & INTEREST-FREE FINANCING AVAILABLE! - WE CAN HELP YOU USE YOUR DENTAL INSURANCE! Your minimally-invasive laser gum treatment for gum disease/gum pockets in the Boca Raton-Delray Beach-Boynton Beach area by a gum specialist-periodontist. Gum disease is a chronic infection that silently destroys bone around your teeth leading to eventual tooth loss. You will often have no symptoms and must be diagnosed by a dentist. 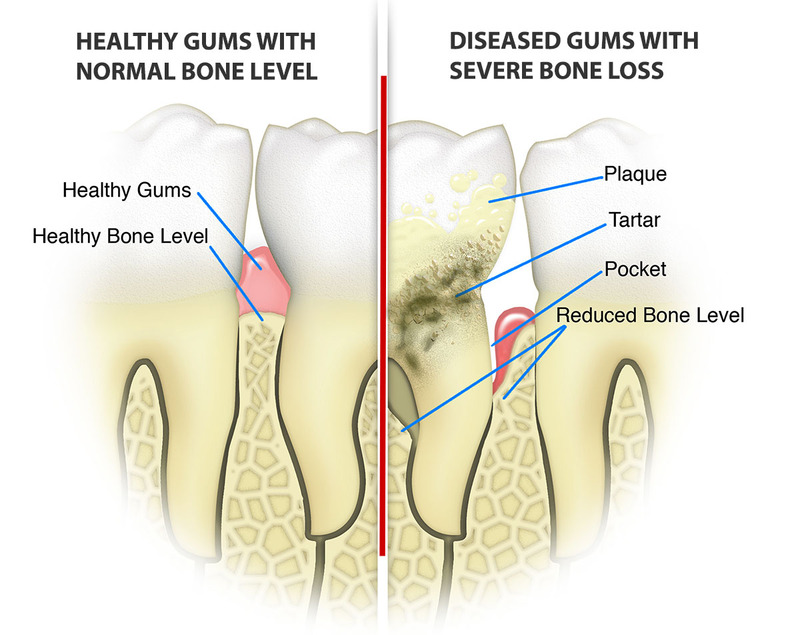 Gum inflammation (gingivitis) can progress to bone loss (periodontitis) and loosening of teeth without warning. 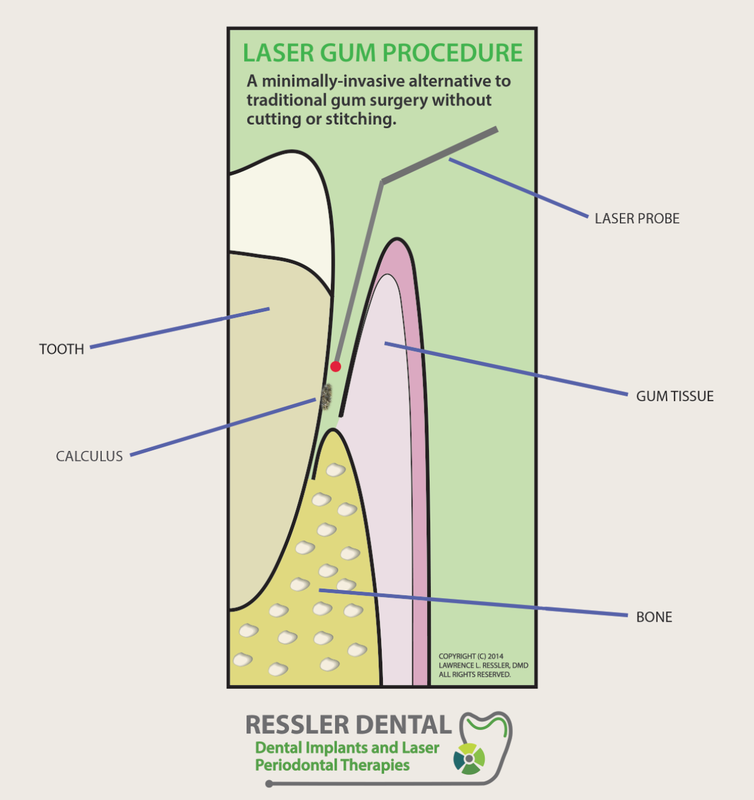 How laser gum treatment works to treat your gum disease. Laser periodontal treatment (or laser gum surgery) is your minimally-invasive and less traumatic alternative to conventional gum surgery for the treatment of gum disease (gingivitis and periodontitis) and does not require cutting or stitching. As a result, it usually does not have the pain and discomfort associated with the older surgical cutting methods. After local anesthesia has been applied (novocaine, lidocaine), the laser probe is gently placed into the space between the teeth and gums, cleaning the diseased gum pocket, killing harmful bacteria, and eliminating diseased tissue. Another laser gum surgery pass with a second type of laser technology uses a higher wavelength to break up hardened calculus (tartar) that sticks to the roots of teeth and flushes out the gum pockets with normal water. The roots are then cleaned further with a gentle piezo-scaling instrument, the latest technology in tooth cleaning instruments. One final pass of the laser is then made to help stabilize the clot to prevent bleeding, reduce or eliminate the need for any stitching, and to facilitate healing, re-attachment of gum tissue to the roots of the teeth, and possible regeneration of bone and connective tissue. We offer dual-wavelength laser gum surgery in our Boca Raton-Delray Beach office convenient to Boynton Beach and Lake Worth, by a periodontist-gum specialist, trained at the University of Pennsylvania and New York University. The latest laser gum treatment technique, Wavelength-optimized Periodontal Therapy™ (known as WPT™ ) evolved from earlier laser gum surgery methods for pockets such as LANAP™ (Laser-Assisted New Attachment Procedure). WPT utilizes the same type of laser energy as the LANAP protocol (the Nd:Yag), but incorporates the use of a second type of laser (the Erbium Er:Yag) for a next-generation twin wavelength laser therapy for the treatment of gum disease. WPT retains some of the advantages of the older LANAP gum surgery technique, but improves the protocol through the use of the higher wavelength laser to safely and effectively remove harmful disease-causing tartar and calculus from the roots of teeth. You will probably need only over-the-counter pain remedies such as acetaminophen (Tylenol) or ibuprofen (Motrin/Advil), if any medication is needed at all, for a day or two following the laser gum surgery. Regular cleaning visits (known as periodontal maintenance) will be necessary at three-month intervals following treatment following laser dental surgery. We also offer second opinions on gum surgery. Call Boca Raton laser periodontist Dr. Ressler today at our Boca-Delray Beach office convenient to Boynton Beach to find out if you are a good candidate for laser gum treatment, the traditional gum surgery alternative! YOUR COMFORTABLE, MINIMALLY-INVASIVE ALTERNATIVE TO TRADITIONAL GUM SURGERY! 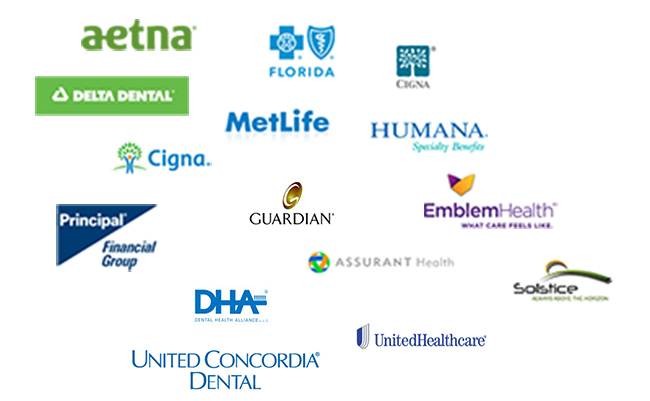 WE WORK WITH MOST DENTAL INSURANCE PLANS! Your gum disease is a chronic bacterial infection that destroys the gums and bone that supports your teeth. 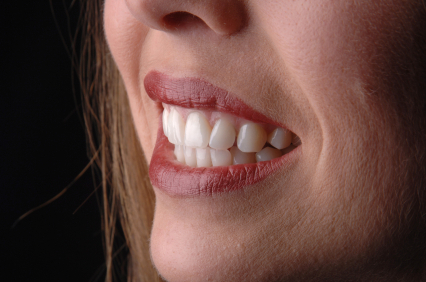 What are the symptoms and causes of your gum disease? Gum disease symptoms often include bleeding gums (gingivitis), swollen gums, periodontal abscess (gum infection), bone loss around teeth (periodontitis), loose teeth, discolored or sensitive teeth, bad breath, sore gums, receding gums, and exposed roots of teeth. Some patients have no symptoms at all, and need to be diagnosed by a gum specialist or periodontist. Most patients are diagnosed with gum disease by their dentist, and deep cleaning or scaling and root planing is often recommended to remove tartar (calculus) from under the gum line. In some cases, antibiotics like Arestin™ or similar medications are placed under the gumline to improve healing after dental cleanings. But in advanced cases of gum disease, these efforts may be inadequate to prevent disease progression and tooth loss. Sometimes gum surgery (flap surgery) will be recommended, or more recent laser gum disease surgery treatments such as LANAP™ or WPT™ laser gum therapy. Causes of gum disease include poor or inadequate oral hygiene, a genetic pre-disposition towards having gum disease (genetics), bacterial infections, a family history of tooth loss, smoking, cigarettes, tobacco use, diabetes, clenching or grinding habits, immune conditions, or other systemic medical problems. Fortunately, gum disease (although it is a chronic disease with no absolute cure), is usually very treatable, especially in its early stages, and you may have many treatment options to help you keep your teeth. Gum disease may also harm your dental implants, as well as natural teeth. Patients with dental implants are also susceptible to gum disease (peri-implantitis) caused by most of the same factors that cause gum disease around natural teeth. Dental implants, like natural teeth, require periodic evaluation, cleaning, and maintenance to prevent future problems. Call Dr. Ressler, Boca Raton, Delray Beach, and Boynton Beach gum specialist, for a convenient appointment to see if you are a candidate for laser gum treatment or other therapies (traditional gum surgery alternatives) to help you save your teeth! Call 561-499-7400 for a new patient exam today! LASER GUM TREATMENT - HELP SAVE YOUR TEETH TODAY! Dr. Lawrence Ressler is a Florida-licensed dentist and periodontist (specialist in gum disease) who received his training at the University of Pennsylvania (D.M.D.) and completed his residency in periodontics at New York University. Dr. Ressler has over twenty years of experience in dentistry. 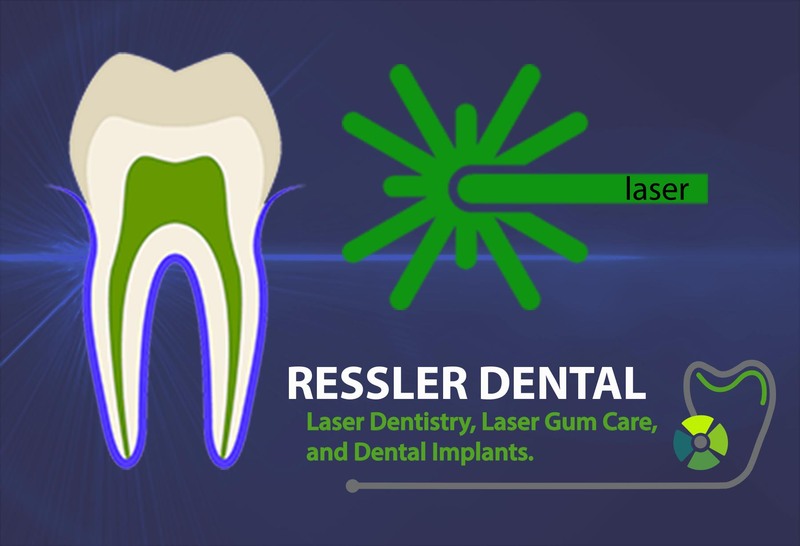 Dr. Ressler's implant dentist, cosmetic dentist, and gum specialist office performs laser gum treatment and serves Boca Raton, Delray Beach, Boynton Beach, Lake Worth, and Wellington. At our modern, high-tech, state-of-the-art RESSLER DENTAL office, our services include laser periodontal surgery treatment, fixing receding gums with the Chao Pinhole technique, computer-guided dental implant placement, smile makeovers, cosmetic dentistry, dental cleanings and x-rays, and just about every dental service you can imagine. 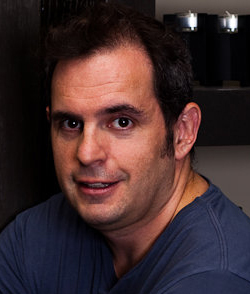 As a Boca Raton periodontist and Delray Beach dentist and implant dentist, Dr. Ressler has served the community as one of the best periodontists and most technologically-advanced dental implants dentists in the Delray Beach-Boca Raton area. Laser gum treatment offers patients an alternative to conventional gum surgery without cutting and stitching, large increases in space between teeth, and the longer recovery times associated with older treatments. Dr. Ressler is one of the few periodontists (and dentists) in Boca, Delray, Boynton, and in South Florida to be certified by Dr. Chao, creator of the revolutionary pinhole technique to treat receding gums and cover exposed roots without gum grafting surgery or stitching. 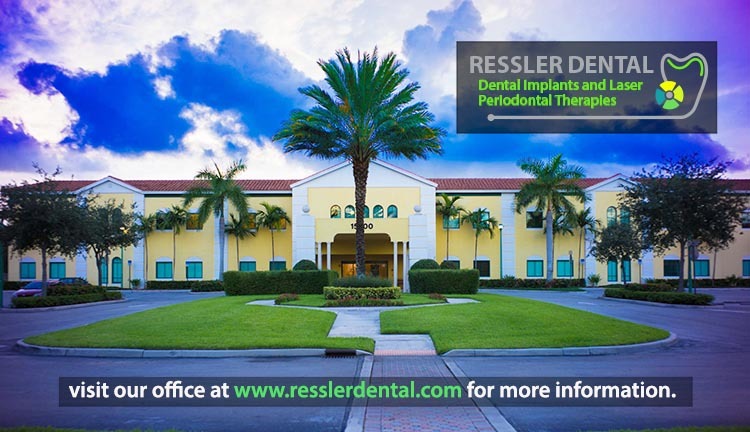 Dr. Ressler, dental implant dentist and gum specialist (periodontst), is now accepting new patients in his Boca-Delray laser gum treatment office.Call RESSLER DENTAL at 561-499-7400 today to learn more about how laser gum treatment and the Chao pinhole gum rejuvenation methods can help you! Lawrence L. Ressler, D.M.D., P.A. Laser gum surgery and laser gum treatment of gum disease. CALL DR. RESSLER AT 561-499-7400 to schedule your consultation today! Convenient appointments. Payment plans and interest-free financing available. Call our office today at 561-499-7400 and a friendly member of our office staff will be pleased to answer any questions you may have about our practice or your particular dental needs! 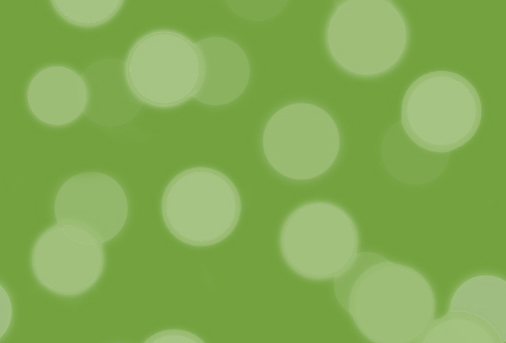 Be sure to ask us about our current SPECIAL OFFERS and INTERNET PROMOTIONS when you call our office! We make dental treatment affordable! MEET DR. RESSLER AND VISIT HIS OFFICE IN OUR NEW PROFILE VIDEO BELOW! Take the first step towards achieving the healthy and beautiful smile you deserve! Interest-free financing and payment plans available. We work with most dental insurance to help finance the cost of your laser gum treatment. Please provide us with your contact information and a convenient time for us to call you. A friendly member of our staff will be pleased to answer any questions you may have or to help you schedule a visit with us. READY TO SCHEDULE A VISIT ? Please e-mail us below or call us at 561-499-7400 today! 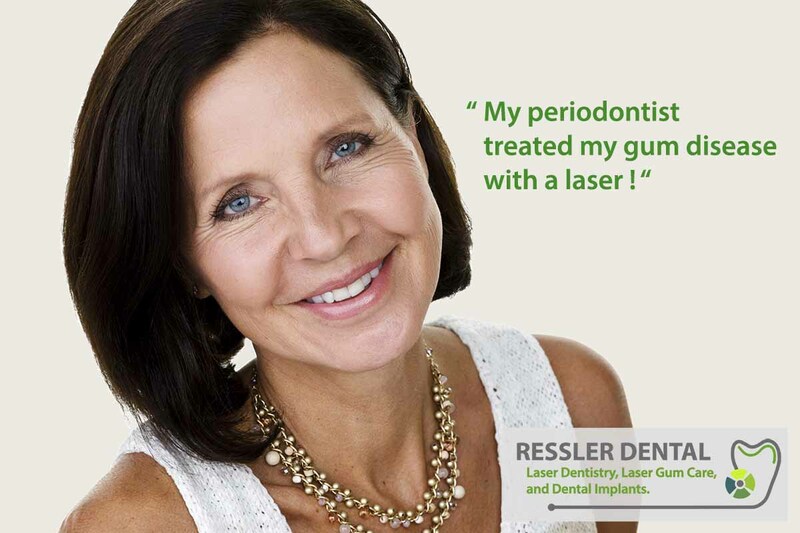 learn more about laser gum treatment at www.resslerdental.com. © 2018 Lawrence L. Ressler, D.M.D., P.A. All rights reserved.